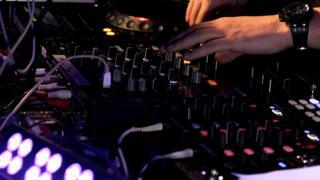 Image caption The dance remix led to the club's manager being detained "for violation against good morals"
A nightclub in Tunisia has been shut down after footage emerged of a DJ playing a dance remix of the Muslim call to prayer, officials say. Video shared on Sunday from the Orbit Festival in the north-eastern town of Nabeul sparked outrage on social media sites. The governor of Nabeul, Mnaouar Ouertani, said that the club would "remain closed" until further notice. An investigation has begun into the incident. The footage shows clubbers at a party on Friday dancing to music played by two European DJs near the popular seaside resort of Hammamet. "After confirming the facts, we decided to close this nightclub," Mr Ouertani said. He said that the club's manager had been detained "for violation against good morals and public outrage against modesty," adding that an investigation was under way. "We will not allow attacks against religious feelings and the sacred," Mr Ouertani said. On Monday, the organisers of the Orbit Festival apologised in a post on the event's Facebook page, but said that they did not accept responsibility for the playing of any offensive music. The DJ "did not realise it might offend an audience from a Muslim country like ours," they said in the post on the social media site (in French). Dax J, who played the call to prayer track, later offered his "sincere apologies to anyone who may have been offended by music that I played at Orbit Festival in Tunisia on Friday".